In April, the Jeep Grand Cherokee, Wrangler and Cherokee each posted sales of more than 15,000 in the same month -- a first. It's also an indication that the smaller Cherokee, pictured, is not cannibalizing sales from its larger, more expensive stablemates. DETROIT -- Chrysler Group sales jumped 14 percent in April as strong Jeep and Ram sales more than offset losses from the automaker’s soon-to-be-replaced mid-sized sedans. Chrysler posted sales of 178,652 in April, its 49th consecutive month of year-over-year monthly sales gains. 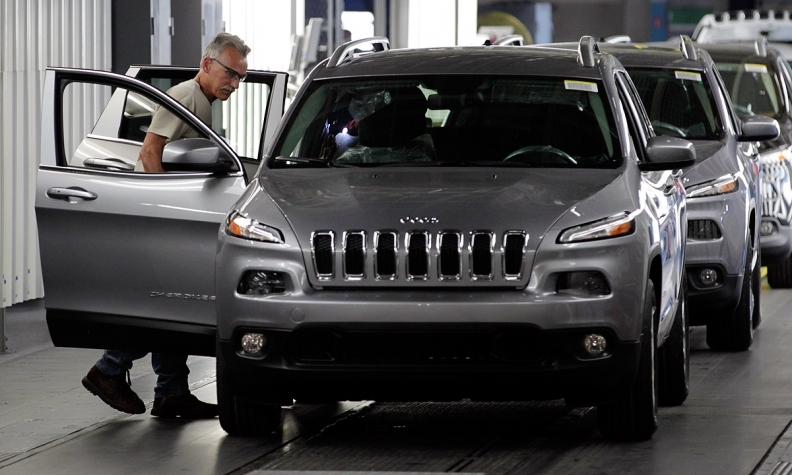 Jeep recorded its best month ever in April, up 52 percent from April 2013. The Grand Cherokee, Wrangler and Cherokee each posted sales of more than 15,000 in the same month -- a first. It's an indication that the smaller Cherokee is not cannibalizing sales from its larger, more expensive brand mates. Meanwhile, the Jeep Compass set a monthly sales record, while the Jeep Patriot and Wrangler set records for April sales. Ram brand sales rose 22 percent last month to their best April since 2006. Pickup sales increased 17 percent. Heavy-duty pickup sales jumped 32 percent, while light-duty pickup sales gained 7 percent. The aging Cargo Van slightly outsold the larger and newer ProMaster van. Dodge sales were mostly flat as rising sales of the Grand Caravan and Journey offset double-digit drops of the outgoing Avenger and struggling Dart. The Avenger ended production this year. A return to warmer weather helped sales of the SRT Viper, which tied its best monthly sales level since its return to the lineup last year. Chrysler brand sales plunged 21 percent. Sixteen percent increases in both the Town & Country and 300 were unable to offset a two-thirds decline in sales of the outgoing 200 sedan. The redesigned 2015 Chrysler 200 is due in showrooms over the next two months. Fiat brand sales climbed 10 percent as sales of the larger 500L more than offset a 22 percent decline in the 500 minicar. The company said it finished the month with a 74-day supply of unsold inventory.